Recently a few items have popped up about grades, grading, and assessment. A few years ago, I also wrote a post about my going to - what our university calls a pass-fail system. Basically, I view it as a growth model and a 'mastery' model. In some cases I want to simply have students explore a topic or try something they have not tried before. I have had more than a few comment that they like the comfort to try things without fear of a poor grade. In a few recent classes, where I had reverted to the usual letter grade system, the students asked me to reconsider - which I happily did. A few weeks ago grading and assessment came up in conversation with a participant in one of my research projects. This high school teacher was talking about how he 'knew' where students were at and did not need a bunch of tests to tell him. We talked about formative assessment and outcome based assessment. It was an interesting discussion, but he still has to give a grade. Also recently a slideshare from a presentation was shared by Jesse Stommel (a slide from another if his decks is with this post). Later, a blog post by Maha Bali (also related to this slide presentation) appeared. 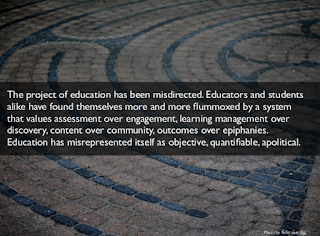 Maha wrote at one point; "I do think that people who are not educators have difficulty listening to these voices that are anti-traditional forms of assessment because they are indoctrinated by the hegemonic discourses they have been surrounded by all their lives. They can’t imagine alternatives to homework and exams, so they assume they must be good, or at least the only options." So true, some educators still cling to these ideas. These items brought me back to my thinking on this issue. As I proclaimed on twitter, I 'hate' grades and giving them, as I mused in the old post, I was brought up in the grading system, I understand why they are used, I have struggled in my thinking about them ... but I doubt their value for motivation - not real motivation anyway, and definitely not for learning. 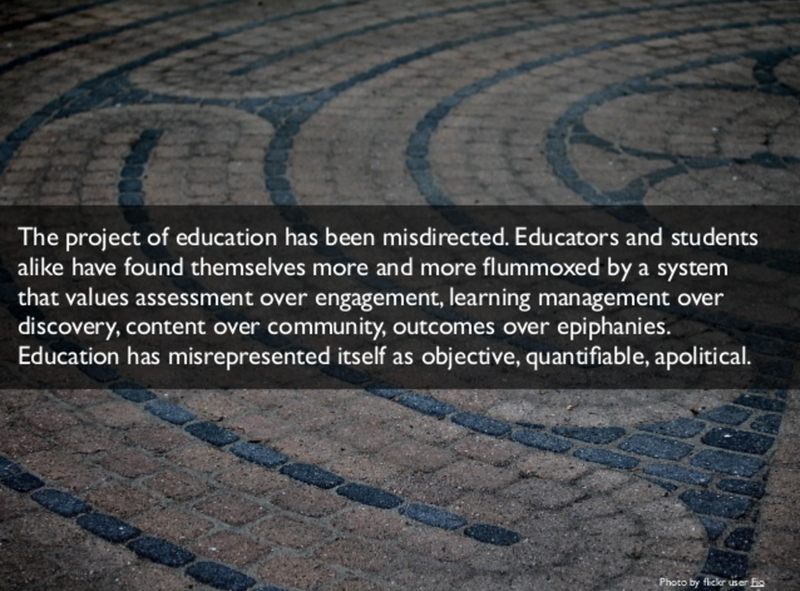 They can be used to rank and sort, but is that the purpose of education? I guess in some instances it is - but I would call that training. In the area in which I teach - teacher education - isn't growth as a (potential) teacher most important? I would rather students engage in deep, meaningful discussions, I would rather my students go outside their comfort zones to try things, to reflect, to learn, to grow. If, for example, we are telling a story by video - isn't the experience and thinking about how the idea can be used for learning in a classroom situation more important than how great the video is (especially if it is the first time making one)? Isn't the discussion and exchange of views and ideas about an issue, like digital citizenship, lead to more learning than telling me what it means in a paper? These recent conversations and readings have renewed my thinking about grading - since I am currently on sabbatical it has not been in the forefront ;-) - and helped reinforce my thinking on the non-use of grades in my own practice.